Don’t let the title of this recipe fool you into not trying it…. my older son just found out that his favorite lasagna recipe was actually good for him and he was not pleased. He’s a true meat-and-potatoes kind of guy who only eats vegetables if they are expected of him… I don’t think he’s ever intentionally chosen to eat vegetables… but he loved this lasagna, which speaks volumes to it’s ability to turn heads and make believers out of meat-eaters. I started by making the “meat layer”. In a medium bowl, mix the Boca Crumbles (see photo for package), marinara (in this case I used much of a Meritage Marinara that I had made earlier in the week), and James River Cellars Cabernet Franc red wine. You want to make this part of the recipe fairly “wet” since you’re not cooking the noodles. In a separate bowl, mix your “cheese layer” ingredients together. Fresh nutmeg is key in this and you don’t need much… just a few sprinkles will do the trick – it adds a back note that is really lovely. Now you’re going to layer your lasagna in a 9×9 pan. Start with your ¼ c reserved marinara,then add noodles, 1/3 meat, 1/3 cheese, noodles, 1/3 meat, 1/3 cheese, noodles, 1/3 meat, 1/3 cheese, noodles, ½ cup reserved marinara, and finally top with Parmesan. I find it extremely helpful to turn the direction of the noodles at each layer so the lasagna cuts nicely. Lay the first layer vertically in the pan, the second layer would then be placed horizontally the third layer would again be vertical so the final layer lays horizontal in the pan. Note: Your noodles will be longer than your pan – just break the noodles and use any pieces that aren’t the same length in the center and keep the longer pieces along the edges. The last step is to bake your lasagna for 50-60 minutes at 350 degrees, until bubbly and cooked through. Let set for 5 minutes before serving so the lasagna has time to let everything “pull back together” and cut beautifully. I find that turning the noodles’ direction is key in being able to serve a nicely “square” piece of lasagna. I hope you find this lasagna to be something that your entire family will enjoy… I also find that if I add a piece of garlic bread or Texas Toast, my guys are even happier. 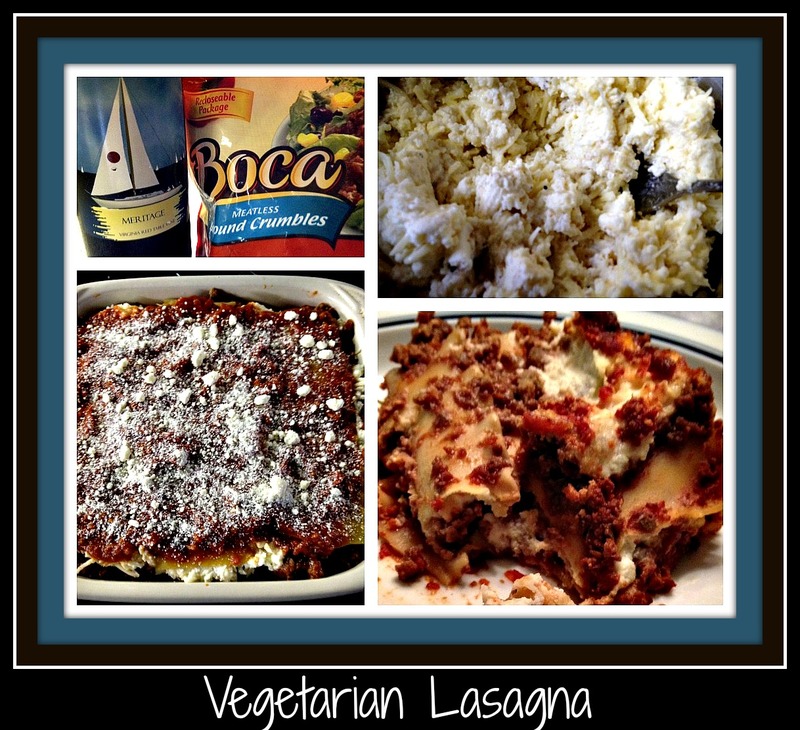 This entry was posted in Health, Recipe, Wine and tagged comfort foods, easy recipe, italian, James River Cellars Cabernet Franc, lasagna, vegetarian.